The 139,000 gross ton cruise ship has returned to PortMiami to begin the cruise lines North American expansion and offer Caribbean cruises on a cruise line that many North Americans have yet to try out. 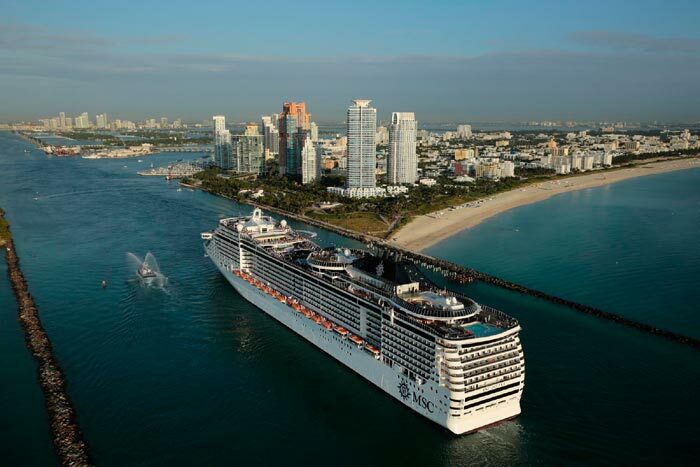 The MSC Divina arrived today at the cruise capital of the world where MSC Cruises has big expansion plans. The ship returns after sailing a summer season in the Mediterranean, before that the ship spent its first season sailing out of Miami from November 2013 to April 2015. MSC Divina will sail a special 10 Nights Caribbean And Antilles Cruise departing on November 11. The 3,500 passenger ship will then commence its regular seven-day Caribbean cruises starting from November 21. The itineraries will alternate between Eastern and Western Caribbean cruises. Just like when the ship first debuted in Miami in 2014 new enhancements and services will be introduced catered towards the American market. MSC Cruises is introducing four new shows to its award-winning entertainment line-up on MSC Divina, including “Treasure Island,” “The Voices,” “Swing” and “The Mask.” In addition, MSC Divina will feature new musicians and bands specifically selected for the U.S. market to play in bars and lounges, as well as new themed parties such as a fun, weekly “fluo” party (a glow-in-the-dark party), and a “snow” party with a snow cannon. There will also be an improved Casino, new wine tasting events and new activities for the kids.